Introduction to the Lunt Filters. In September 2011 Company Seven apologized in our C-7 News page to our fellow astronomers in the mid-Atlantic region, after our first new Lunt solar telescope arrived. After making deliveries of Lunt telescopes for nearly a year to our customers who planned to see the Total Solar Eclipse and the Venus Transit in 2011, this LS80/DSII/B1800/PT/FT Hydrogen Alpha (Hå) solar telescope arrived on 5 August and could be spared for demonstration purposes at our events. For some weeks since then the formerly beautiful weekends turned from clear, sunny and dry to overcast, raining and wet. It was only on 13 August that we were able to sneak the Lunt 80 outdoors alongside a Lunt 60mm Double-Stack Hå telescope (LS60/DS/B1200/PT/FT) for brief moments of solar observing between the newly arriving thunderstorm cloud banks. It was worth the wait! Right: first sneak peak at the Sun with our new Lunt LS80THå/DSII alongside a Lunt LS60THå telescope. Each is set for observing the Sun atop an optional German Equatorial Mount outside Company Seven's showroom (130,026 bytes). Our Lunt telescope provides an 80mm aperture, operable by pressure tuning in either standard single or Double Stack configurations, and with the B1800 blocking filter component in the diagonal at rear. Click on image to see enlarged view (446,834 bytes). These Lunt telescopes are purpose built solely for studies of the Sun an cannot be used for looking at other conventional celestial or terrestrial objects. These systems filter sunlight so that one sees the Sun as a deep red disc contrasted against the blackness of space. 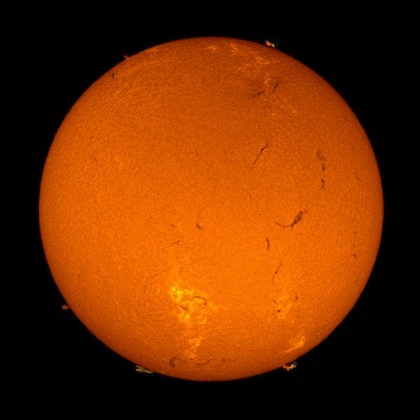 The image of the Sun is brought to focus at a point beyond the focuser. An eyepiece for viewing or a camera for photography can be attached to the focuser. Our new LS80THå/DSII model is for display and joins our inventory of Daystar and Solarscope Ltd. Hå filters too for Saturday solar observing sessions at Company Seven. The filter components are so precisely made that any change of ambient temperature alters the bandpass, so in order to compensate, a piston attached to the filter housing is adjusted to 'pressure tune' the bandpass by dialing in or out to bring the filter to its best performance setting. 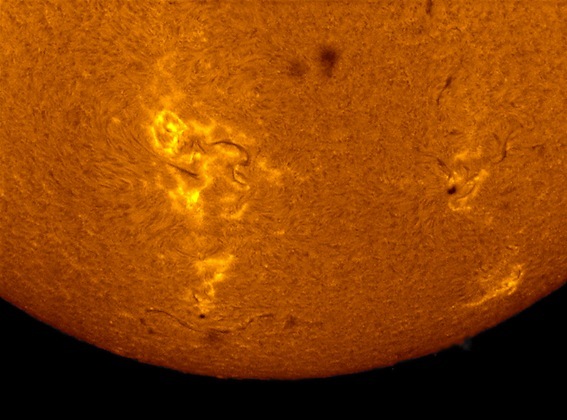 With a primary filter alone the bandpass is between 0.7 to 0.8Å (Angstroms) centered at 653nm; so details on the surface of the Sun and surrounding prominences are seen. Ours is among the first of the new Lunt DSII series telescopes indicating 'Double Stack at the rear' so one can attach a second filter component in the black housing just behind the red collar to further narrow the bandpass to 0.5Å or less. This provides added contrast of details on the Sun's disc and of the more massive ejections and prominences, at times appearing three-dimensional. In apertures of 80mm and smaller these are rugged and compact telescopes, easy to travel with. We placed the LS60THå alongside the LS80THå/DSII with 1.25 inch diameter diagonal attached for scale, note the focusers are 2 inch 'FeatherTouch' models with braking made by Starlight Instruments. Overview: The Lunt solar telescopes and filers are tuneable Fabry-Perot etalon based filters made to pass a very narrow amount of light from the Sun in either the Hydrogen Alpha (Hå) or Calcium K-line (CaK), with very good performance and at a comparatively reasonable cost. The Lunt solar telescopes (indicated by LSxxT designation) are built upon light weight optical tube assemblies that incorporate an objective lens and focuser that are mated to the appropriate interference Etalon and Blocking Filter. The telescopes are engineered to provide views of the Sun in Hå or CaK (Calcium K-Line) portions of the spectrum. Lunt manufactures solar telescope systems with apertures as small as 35mm; these small telescopes can be fine for someone who has space constraints or must travel or backpack, or they can provide an introduction to the major phenomena of the Sun for a science class. 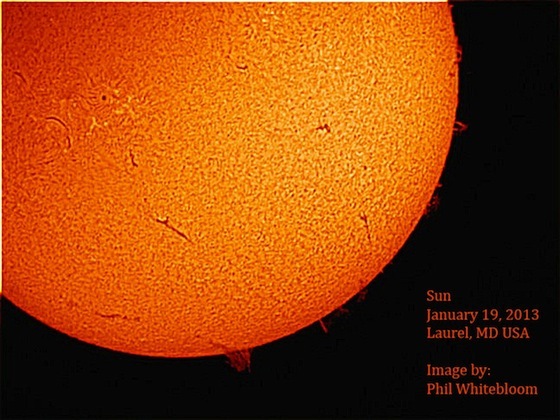 But the Lunt 60 to 80mm aperture LSxxTHå products are the solar telescopes models most sold by Company Seven; these have been developed to satisfy those who wish to see inspiring views of all the phenomena that can be seen in Hydrogen Alpha while preferring to keep this manageable to carry or easily travel with. While those larger Lunt solar telescopes of 100mm, 152mm and the 230mm are 'transportable'; these larger aperture systems will of course provide brighter images routinely and finer resolution of solar details on the best (steadiest and most transparent) days. The Lunt solar telescopes based upon the 80mm systems are the ones most-recommended by Company Seven to clients who seek a good balance of performance and versatility since the 80mm models provide enough of an increase in light gathering power over the 60mm telescopes to make the 80's better suited for use with binocular viewers (such as the industry standard Baader/Carl Zeiss Mark V Großfeld Binocular Viewer). The increase in photons factor is also beneficial for imaging as it permits cameras to be set with quicker shutter speeds to better improve the chances of freezing the Sun during a momentary reduction of scintillation. Left: It doesn't get much easier to manage than this Lunt 60mm Hydrogen Alpha solar telescope, shown outside Company Seven 21 May 2011 (95,474 bytes). This set consists of the LS60THå telescope with single interference Etalon at the front and Blocking Filter at the rear. The Lunt telescope is supported by a lightweight and economical (yet well suited) Orion brand motorized German Equatorial Mount and aluminum Field Tripod; the entire set can be carried as shown assembled by an average adult. 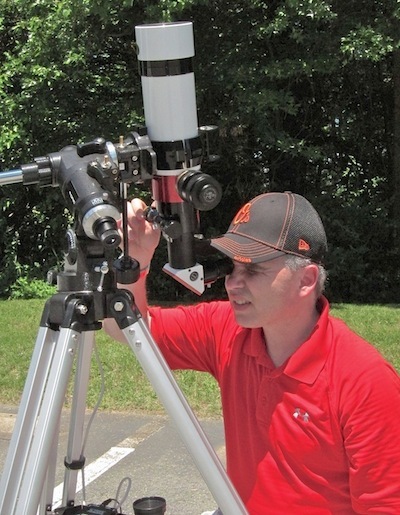 The observer at the eyepiece is Mr. Phil Whitebloom who has been involved in amateur astronomy for decades, but only in the recent years discovered our Sun. He has progressed so far into imaging that he now hosts his own web site PW Hobbies where he hosts images and articles of advice to help fellow enthusiasts. Click on image to see enlarged view (201,164 bytes). The Lunt 60mm and 80mm models are so light and compact that they are carry on luggage portable (with a suitable carrying case), and Company Seven can furnish the telescopes with a tracking German Equatorial Mount lightweight enough to allow you to carry the entire assembled system in or out. We even offer Solar Panel powered tracking mounts so you need not feed the mount costly batteries, and that makes the battery-free system not simply economical to operate but even lighter weight to carry. The Lunt LSTHå series telescopes incorporate a single interference Etalon, this may be installed at the front of the telescope or on the pressure tuned models this will be incorporated into the optical tube assembly of the telescope and just ahead of the focuser. 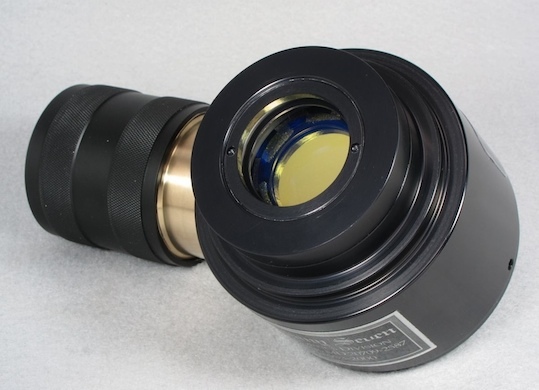 The diameter of the LSHå series telescope objective lens or the Etalon is what characterizes the model; hence 60 or 80mm or larger for example; these are full aperture and completely unobstructed arrangements. To compensate for environmental changes that occur routinely, each LSTHå telescope incorporates a mechanism for Doppler Tuning of the Etalon; this is either by a direct manually operated tilting mechanism built into the Etalon filter cell controlled by a dial, or by a pressure tuner that changes the density of the air in a sealed Etalon housing controlled by a piston that is threaded in or out from the pressure tuner housing. Either arrangement is simple to operate and works well. Single Stack or Double Stack? The next major characterization of the Lunt Hydrogen Alpha telescope or choice to be made when ordering, is whether or not it is will be in either a Single Stack or Double Stack configuration. The Double Stack module of the Lunt system similarly may be threaded onto the front of the telescope, as is the case with the LSTHå 80 for example. Or the Double Stack module may be a second in line component that is attached just behind the primary Etalon as in the case of the LSTHå 80. It is a simple matter to change back and forth with or without the Double Stack module installed since the precisely machined assembly is attached by means of three hand knobs, as is the Focuser of the telescope. For the quickest transitions Company Seven recommends simply ordering a second Focuser to be left attached to the Double Stack module; this eliminates two steps in the changeover process. Right: Lunt LSTHå 80 Hydrogen Alpha solar telescope rear mounted Double Stack component undergoing checkout at Company Seven (72,457 bytes). Click on image to see enlarged view (182,363 bytes). Note: the Lunt Double Stack modules are not made to replace the primary Etalon built into the Lunt Hydrogen Alpha solar telescope, nor is it safe to attach the Double Stack module onto any other than the intended Lunt Hydrogen Alpha solar telescope; one cannot operate the Double Stack module without it being in-line and behind the intended primary Etalon. The Double Stack modules are manufactured to the same high precision specification; the modules are not matched to one particular LuntLSTHå telescope, only to the series for which that module is designed. So it is possible to order a new Lunt telescope from Company Seven in a less costly basic arrangement operating at 0.7 to 0.8Å, without the Double Stack module, and at a later date order the second module to provide the user with the choice of operating at 0.7Å and 0.5Å. Of course, if you are sure that you prefer the versatility of both configurations then you can order your new Lunt Hydrogen Alpha solar telescope to be delivered complete with the Double Stack module, with or without the optional Focuser. Right: Lunt B600, B1200, and B1800 Blocking Filter components undergoing inspection for delivery with new telescopes from Company Seven (39,396 bytes). Click on image to see enlarged view (129,055 bytes). The Blocking Filter impacts the selection of accessories that will be practical for use with the Lunt solar telescope. For example we at Company Seven prefer to see the 60mm and larger LSTHå telescope models provided with the B1200 or even the B1800 blocker as this allows coverage of larger diameter eyepiece field stops or camera film or CCD's with no vignetting. Thus "photographic" versions of the THå series telescopes will incorporate a larger aperture Blocker than the visually oriented versions. A Lunt filter or Lunt 35/60/80mm LSTHå telescope with a single interference Etalon and Blocker will operate at about 0.7Å (Ångstrom) bandpass centered at 656.28 nm. If you order a 'Double Stack' Lunt filter or telescope, then that will be provided with two Etalons, each in its own cell. This permits the user to tune in a system at approximately 0.7Å with one Etalon, then attach the second Etalon and tune it in for best performance at approximately 0.5Å. Larger aperture Lunt solar telescope models vary somewhat in their designed bandpass. 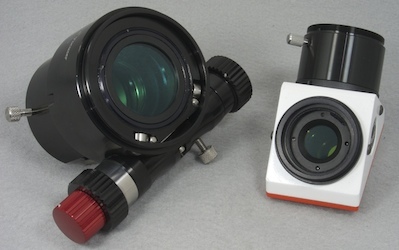 Focuser and Accessories The Lunt THå telescopes optical tube assemblies are not only modular in the sense of being able to interchange single or double-stack Etalon(s) and Blocking Filters, but Lunt provides a choice of Focuser as well. The basic choices are a Crayford-style arrangement with dual-speed focus control. But for our customers who intend to attach heavier payloads (Binocular Viewer, CCD or DSLR camera, etc.) Company Seven recommends specifying the "Feather Touch" focuser. This is a fully machined dual speed focuser made by Starlight Instruments in the U.S.A. and sold by Company Seven. This incorporates a 10:1 geared pinion assembly, that allows more precise control especially when carrying the load of a camera or binocular viewer. Right: Lunt 100 Hydrogen Alpha solar telescope 2 inch dual speed geared Focuser with integral B3400 Blocker alongside B1800 for comparison, at Company Seven (39,195 bytes). Click on image to see enlarged view (123,841 bytes). The carrying case in which a typical Lunt filter or telescope set is provided is a simple foam lined fiberboard case that is lightweight and convenient for routine carrying about or storage. This is not an approved shipping case and so for example, Company Seven does not recommend checking in your Lunt system as baggage at the airport in this case. However, Company Seven can provide a custom and ATA shipping-approved custom case to better protect your investment when in transit or for packing among other packages that might damage the standard Lunt case. Sure, Company Seven is aware of competing solar telescopes and filters some that cost half the cost of a similar aperture Lunt, but no similar arranged filter can deliver the fidelity of the views seen or images captured by the Lunt. Lunt products provide our clientele with most of the fun that there is in solar observing but at half the expense and complication that our next higher level systems would exact. And those people who do choose to buy from Company Seven are the most demanding of the Lunt clientele in the Americas. Company Seven: is among the most long-lived and experienced distributors of the Hydrogen Alpha filter systems in the world. We are one of only a couple experienced sources showing and selling the filters manufactured by Lunt, by DayStar, and by Solarscope from the Isle of Mann. 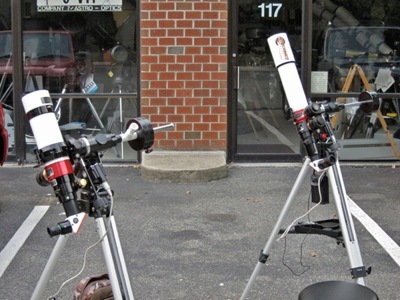 We serve an international clientele but have also established our own "Solar Saturdays" observing program hosted at our showroom and at times hosted at other public locations when supporting regional non-profit astronomy clubs. We feature telescopes brought by friends as well as our own SolarScope Ltd. filters from the Isle of Mann including our Solarscope DSF-70 filter set, our Lunt 80mm Double-Stack and Lunt 100 Hydrogen Alpha telescopes, several DayStar Filter Co. models including: DayStar QUANTUM PE Series 0.3 Angstrom and DayStar QUANTUM SE Series 0.6 Angstrom Hydrogen Alpha (12 vdc oven models), DayStar T-Scanner 0.5 Angstrom Hydrogen Alpha (a portable model that requires no power to operate), and DayStar 2.0 Angstrom Single Cavity Calcium K-Line filters among other "white light" filters which we offer. So it is not likely you will raise a question or seek advice that we cannot offer a good reply to, but if you do ask a question that we can not answer then we will most likely know who to ask or what to calculate in order to provide you with the correct answer. Right: Thumbnail sized image of what is happening on the Sun as seen through a Hydrogen Alpha Filter at the NSA National Solar Observatory (8,997 bytes). Click on the thumbnail image to see a much larger and more detailed image from the NSA GONG (typically 437,000 bytes). Java and popups must be enabled. 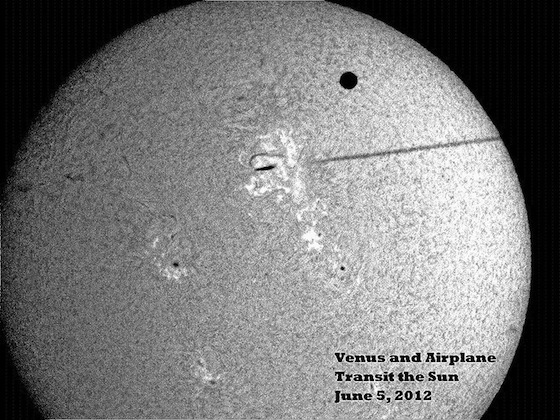 The Venus Transit, with Venus and an airplane passing in front of the Sun. Lunt 60 Double Stack, monochrome SBIG STI CCD, 5 Jun 2012 (120,676 bytes). with SBIG STI CCD (colorized in post processing), 19 Jan 2013 (95,017 bytes). and monochrome Point Gray Flea Flea CCD; 9 Jun 2012 (80,775 bytes). Point Gray Flea CCD (colorized in post processing); 9 Jun 2012 (37,164 bytes). Few experiences can match observing the dynamic force that exists in the chromosphere of our Sun. Lunt is proud to offer safe, quality, easy-to-use filtering systems specially designed to bring this observing experience to you. Lunt Hydrogen Alpha filters enable professional and amateur astronomers to witness the hidden dynamics of our sun. These unique sub-Angstrom filter systems allow observers to explore many facets of solar research. Watching solar flares evolve above the solar disc, prominences swirling against the inky blackness of space, subtle plage and textured filaments sinuously traversing the sun add to the observer's viewing enjoyment. Smaller features such as spicules and intricate mottles change from moment to moment giving the impression of wild fire. We are proud to hear that many consider a Lunt filter to be the best of its class, and a most powerful observing tool. With a Lunt filtering system, observational programs are limited only by the desires of the observer. The view is constantly changing, the Sun's appearance has never been, nor will it ever be exactly the same as today." Incidentally "Solar Astronomy Handbook" is an excellent reference guide on the visual and imaging the Sun. You will find this book for sale stocked among many other solar-related titles at Company Seven's Laurel, Maryland showroom book case.